Jeffrey Eggleston was our guest on Episode 13. C259: Jeffrey, welcome to the Cloud. Jeffrey: Hi Gregg, hi Brenn, thank you guys so much for having me on the show. I’m really happy to be here. C259: How has your training been in preparation for Moscow? Are you tapering yet? Are you packing your bags yet? Jeffrey: A little bit of everything. Training has been going great. I’m just beginning to scale back my total volume getting ready for the marathon. Tomorrow is my last important workout. I usually always do something about 10 days out from the race, so I have an important workout to get through tomorrow, and then I’ve pretty much jumped the last hurdle and then it’s really just kind of running by feel from now until the race, and just giving myself some time to recover, go through supercompensation, and then obviously get to the race and travel. I’ll be leaving next Monday the 12th, so I’ll get over there I think Tuesday, because you lose a day in travel. I’m ready to go, and I’m really happy with how things have gone the past 15 weeks here in Boulder, so I’m very excited. C259: That’s terrific. What’s the workout tomorrow that you have to get through? Jeffrey: Tomorrow I’m doing a specific marathon block. So in the morning I’m going to warm up and then I’m going to do 10k moderate, and we are up at elevation here. Give myself a bit of time, and then I’m going into 12k at marathon pace. I’m going to run marathon pace here even though we’re at 5,000 feet. And then I get a little bit of a break. I get to rest up in the afternoon. When I come back I’m going to do 10k moderate again in the evening, and then I’m going to do 4 x 3k, with three minutes recovery. Total volume will be about 45K tomorrow, or 50k tomorrow, maybe. C259: Wow. What’s your peak mileage been like per week? Jeffrey: Peak volume probably around 140-150 miles. Really the emphasis is on quality. My long days are long, my recovery days are really easy. It’s not about getting out there and running a solid 20-25 miles a day. Some days are longer, some days are shorter. There’s definitely a dynamic that I go through with mileage. Really when I lay out my training we can go into this in more detail. The emphasis as we get closer to the race is more on a specific intensity or endurance focused for the marathon, so the time I spend at the specific pace of the marathon is more important than the total volume that I’m putting in. C259: We’ll get back to training later one, but what are your goals for Moscow? Jeffrey: First and foremost, this is my second World Championships experience, and I really want to redeem myself for my performance in Daegu. I was 39th and it was a really disappointing experience for me. I can’t really explain why or how in detail what exactly went wrong in Daegu because I felt my training was going great leading up to that point. I had just run 2:13 in Grandma’s and three months later I felt I was in better shape, but I think this time around I understand that going into a World Championship there are a lot of variables. You can have great training and a great buildup, but you still have to go into the race with your guard up and run a smart, tactical race. I’m really just trying to capitalize on my fitness on that day. If I can improve on Daegu, which is a low-hanging fruit at this point, that would be great. C259: How is it different, though, how is it different from, say, a big city marathon? Jeffrey: Well, in all races except the New York City Marathon you don’t have pacers, so the race is governed by whatever athletes decide to take it out, and in a lot of these World Championships they to out pretty fast and sustain a high intensity the whole way. I’m not worried about whether the race is going to be too fast, but I definitely, conditions permitting, though we are going to be running at 3:30 in the afternoon in Moscow, looking at the weather right now, it could be nice, it could be humid, it could be rainy, it could be a little bit warm. We don’t quite know yet. For me, it’s about running tactically a smart race. If I can run a personal best I’d be extremely happy. That’s what championship races are about too, it’s about getting out there, competing. There are a lot of scalps I want to take if I run the right race tactically for myself. Those are my big goals going into Moscow next week. C259: Have you spoken with your teammates Carlos Trujillo and Daniel Tapia? By the way, I think Daniel Tapia is taking the Bar exam early this week. He was a late entry to the field after Mo Trafeh pulled out with an injury. Have you spoken with them or will you speak with them once you are in Moscow? Jeffrey: As of now, I haven’t spoken with either specifically about the race. I know Carlos a little more than Mo or Daniel who is replacing him now. Carlos and I have been in touch a few times, and it’s just nice to touch base and obviously I was really happy for him to have this experience of running in the World Championships race too. But given the circumstances that we’re all from different training groups, and the IAAF has eliminated the team competition – there is no team cup this year – It kind of makes it a scenario where it’s every man for himself out there. That being said, I’m really excited for both Carlos and Daniel and if they are in the race in similar circumstances, we’re wearing the same uniform so we’re definitely going to work together. But at this point in time there’s not too much to talk about tactically or just about the race other than that all three of us are going to give it our best effort, and I know that’s going to happen. C259: It is interesting that you have the best PR of the Team USA because we had on the show Patrick Rizzo a number of episodes ago, and he went into London gunning for your time, looking to get in the top three. Little did he know that he could have run a slower time and still made Worlds. I don’t think he would have run London any other way, knowing Patrick from the interview, but it kind of begs the question that the U.S. has the opportunity to bring five marathoners rather than three. I was wondering if you had any thoughts about that. Jeffrey: Well, that’s an interesting point you brought up about Patrick. Obviously I know him well from when we were teammates and living together in Michigan, and now we are both out in Boulder of course. There was uncertainty for me to make the team even at the beginning of this year. I definitely felt the pressure just as Rizzo did and as I’m sure a myriad of other athletes in the U.S. did. I was hoping this Spring to go chase a better time to secure my spot on the team. It was clear from USATF that they were going to send three athletes. To really be in consideration we clearly knew when the window was, it was October to the beginning of May, so we knew what our time window was. Personally, I’m okay with having three athletes instead of five. I definitely don’t understand how having two additional athletes would be a detriment to the roster. It’s a great experience for developing athletes to get out there and put on the US jersey and represent our country. That being said too, also being on the U.S. team, it means that you are the upper echelon of your discipline, and the point of trying to earn that selection is to truly be at the top of your discipline. It’s a little bit different with the marathon because there are a lot of conflicts of interest. There are a lot of marathons and athletes can be in good shape, there can be injuries, you can run in different conditions. There are definitely more variables in that selection process. In hindsight looking at how the team was selected this year, I would have been totally fine with the window being larger for selection, so maybe going back to Olympic Trials performances in Houston in 2011. That race indicated that we have really good depth in the marathon, and I could realistically see sending three 2:11 marathoners to the World Championships that would really want to do it. But based on the criterion, we all knew what it was, I feel lucky and fortunate that things have gone the way they have and I have earned this opportunity. I plan to capitalize on it. C259: I guess you are at an advantage if you think of it in terms of a career, in that you are unafraid of running a lot of marathons, so it’s not like running World’s is a lost opportunity to make some money running a fall marathon. In fact, it was recently announced that you will be running the New York City Marathon this fall. Why did you decide on the Big Apple over Chicago where you did so well last year? Jeffrey: That’s a great question. World’s is a huge focus for me, and I’m not holding back so I can go do a fall marathon later on. It wasn’t necessarily a decision of New York versus Chicago. There are a lot of races that are great opportunities, marathons especially, in the fall. There are some great, viable options. Eight weeks after Worlds is the Medtronic Twin Cities Marathon. Incidentally, that is the U.S. Championships this year. That is one that I was highly considering for awhile. Certainly, my track record, I’ve had experiences running marathons close together. I stand behind my results, they’ve been pretty good, doing two marathons with a month in between or so. My final decision to do New York City just came down to me believing that at this point of my career I want to swing for the fence each time I do a marathon. There is an optimal time between Moscow in August and New York City in the beginning of November. I can give myself adequate recovery and time to really prepare and again try to swing for the fence. Moscow is a big stage and New York City is a big stage. For 2013, those are the two biggest marathon stages in the world, and I feel really fortunate to be able to run both of them. It requires a lot of preparation and a good buildup, and I want these two marathons to be marathons I can be proud of. C259: Have you watched the New York City marathon before from the city or have you run part of the course before? Jeffrey: In  I ran the New York City Half Marathon. I ran part of the course, I ran through Central Park, the rolling hills, and back through Battery Park. The New York City marathon never really caught my attention until probably when I was in high school. I grew up in Rochester, New York, so it’s not that far from the race. I think probably 2002 was the year I really started noticing the marathon, and being like, hey these guys can run pretty fast. I do have the distinct memory of watching Rodgers Rop win in 2002. He was one of my idols growing up in the marathon, because he won Boston and New York in the same year and that was really incredible. When you are a high schooler, it’s hard to imagine running a marathon. You run the 3200, you don’t think about 26.2 miles. C259: Incidentally, that was the first marathon I ran, that 2002 Rodgers Rop win. That was a cool race. Jeffrey: It was awesome and I was really impressed. Maybe I didn’t understand the culture of marathoning. I didn’t understand which athletes would be the top athletes, but for whatever reason that just sticks in my mind, and I was impressed. It fired me up and I thought hey, what if one day I run the marathon. That took many years to realize. C259: Before the show I was doing some research on Jeffrey and I’m from Rochester, New York too. Interestingly, we ran on some of the same courses in high school. I noticed at the McQuaid Invitational you spotted a time of around 15:01 or something [15:05], which struck me as a fairly good race. You were very strong in high school, you did some running at Virginia I understand, but it wasn’t until after high school and college that you really caught the World’s attention, I suppose. What is surprise to you when it seemed like this could be a career, or that you could make a living doing this? Jeffrey: That’s a good question, and there was always an enjoyment with running since high school and I think there were some moments at least in high school when I thought hey, I could be really good at this if I continue to pursue it. After college having that individual focus, putting in the consistent miles and training, I really enjoy it outside of a team atmosphere. I’m better able to direct myself when I’m doing my own training. C259: A little Ryan Hall-ish. Jeffrey: (Laughter) I don’t know. I don’t know the whole situation, but for me personally I continue to improve each year. I never put a limit on what I could do. There were definitely some surprises and some breakthroughs along the way that were great, but also at the same time I thought well, this is a long time coming or I’ve been doing this consistently for long time that if you put the work in over time eventually you reap the benefits of it. Sometimes you just don’t know when it’s going to finally catch up with you and when you’ll make that big jump. C259: One race from your career that I’m very interested in is the 2011 Pittsburgh Marathon. I’m trying to piece it together. You were hired as a rabbit, and you ended up winning the race. So you were rabbiting some runners who were behind, is that right? Jeffrey: Right, so I was hired by the PIttsburgh race organizers to help – this was the year leading up to the Olympic Trials, for the marathon. Pittsburgh did an awesome job, they wanted to give some incentives and sweetners for athletes hoping to qualify for the trials by doing it at their race. T o help facilitate that, they brought me in as a pace-maker to run 2:18, which was the required time to get into the Trials, so I had a couple of American athletes who I was pacing, actually one of them, just switched citizenships, Boaz Cheboiywo, so for the majority of the race there wasn’t much pressure on me because I was just supposed to run 5:18 or 5:20 per mile and help pace Boaz. They did give me the option, they said after 18 miles or 30k if you want to continue and finish the race you can do that. If not, you can just drop out and you got your workout in and that’s the end of your duty for the day. C259: You were on a leash for 18 miles. Jeffrey: Yeah, and honestly for a lot of the race I didn’t really pay attention to where any of the leaders or where anyone else was, because I was like okay, we’re running 5:18 pace with Boaz and he’s feeling okay and my focus was on helping the guys trying to get 2:18. That being said, Pittsburgh is a tough course. It’s pretty hilly, there are some sections where you can run a lot faster, there are some sections where you can run a lot slower because you are climbing. It’s a challenging course to set that steady pace that some of the trials hopefulls needed. You know, when we got to the 18 mile point and my duties were done with, there was no conflict of interest because I did what I was supposed to do first, then I looked up the road and I saw that the leaders were there and thought, gosh, I’m felt pretty good. At that point I didn’t want to drop out, and I thought hey, what the heck, why not give it a try. Obviously when you are in pretty good shape and able to run a 2:12 or a 2:13, running 2:18 pace isn’t going to hurt you so bad, so there’s a lot left in the tank. It worked out. On other days, maybe I would have finished second, maybe I would have finished third. There were some very good international athletes in the race. C259: How did Boaz end up finishing in the race? Jeffrey: I think he faded pretty badly to 2:22 or 2:23 [ed. note – 2:27:17]. He was having a problem with his hamstring because of the hills. C259: At 18 miles when you were feeling good, was he still with you at that point or was he shot, at that point? Jeffrey: He was kind of yo-yoing, going back and forth. I didn’t say, hey, I see the leaders up the road, I’m going to pick it up. Because really my commitment was to him. If he needs me to go grab his water, I’ll go grab his water, it’s not a big deal for me. Once that was done with and we were through 18 miles, I didn’t want to mess up anybody’s race – if Boaz was right on my heels and really needed the help, that would be me staying with him – but things just had to align properly that day. For whatever reason, I had the opportunity to go up and challenge the leaders and feel good enough to come out the victor. It gave me some confidence and made me believe this is the right event for me. You learn a lot about racing when you are in a circumstance like that. Obviously 2:16 is not a very good time, but the way we ran it – surge after surge after I came into the lead, these guys turn around and they are like, hey, where did this guy come from? So it’s me pushing the pace and trying to throw some curveballs at them to really make this work. I think also too it takes a mental toll on your competitors. Like I said, for whatever reason it worked out, and gosh It makes a great story I guess. C259: How far were you behind the leaders at mile 18? Was it about a minute, was it longer? Jeffrey: I’d say probably about a minute. At that point in the race, you see athletes who are casualties from the lead pack come back to you. First it’s one, then it’s two. Then you just see a group up ahead, and you’re like, oh, maybe that’s the lead group. Then you get close enough and you see the media truck, and you’re like oh, that’s the front of the race. That was pretty exciting for me. I think that gave me the momentum because I totally didn’t expect it. The first thing I did once I caught up to the leaders is I threw in a one-minute surge because everybody looked around, they saw me, I saw the press truck, and I said well I’m going to just go for it, at 19 and a half or 20 miles and see what these guys can do. At 18 miles I wasn’t sure where they were, if they were that close within striking distance. C259: Speaking of surges, another race we wanted to talk about was more recently, you won the Chicago half-marathon in 1:05:41. Were you running that at marathon training pace or all out? Jeffrey: It’s a good question, it’s probably between the two. The last 3 or 4 marathons I’ve done I’ve gone out in about 1:05:30, trying to go for that 2:11 or sub-2:11 pace. 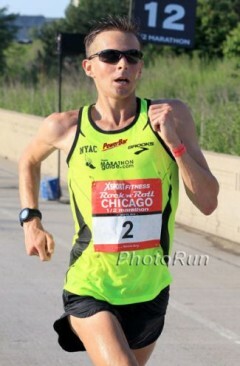 For this race, it was pretty warm in Chicago, and humid. The first thing is, this is an opportunity to whet my competitive appetite, to get some racing experience in before the World Championships. I kind of let what the other athletes were doing early on dictate my pace. Definitely with a 1:03:50 PR I think I can go a little faster. I feel pretty good about my shape right now, maybe I could even do a half PR on the right course and in that right conditions. That being said, the conditions are pretty tough out there. Sometimes running 4:55 to 5:00 pace can feel tough. It definitely felt tougher running out there than it did last October when I ran the marathon, where I think I split 1:05:27 through the half. The important part of that race, I came out of it pretty pleased with the effort. The emphasis was all on effort, and putting a good hard effort out there. Usually 4-6 weeks out from the marathon I do like to get out there and run the prescribed marathon pace that I’m hoping to achieve in the race at sea level or even at a little bit of elevation run 4:58 to 5:00 pace and try to sustain that for 13-15 miles and that’s what I did in some heat and humidity in Chicago, so I felt pretty good about it. C259: You put in a big surge for the win, pulling ahead of a Kenyan who was running with you. You said afterwards – I love the quote – you said I wanted to give the fans a chance to see USA pulling ahead of Kenya. It makes me wonder, do you think American runners are sometimes intimidated by the Kenyans or Ethiopians? Jeffrey: I don’t know, I can’t speak for all Americans – it just depends. But I can say that the circumstances in Chicago, that part of the course was where I really wanted to put on a surge to make the race exciting. I wanted to make it as exciting as possible for the athletes out there. I definitely know my place. When I line up in the World Championships against 2:04 to 2:06 marathoners, I know it’s a longshot to try to complete against these guys when you are 2:12. USA pulling away from Kenya may be more difficult in Moscow than it is in Chicago. That being said, I go into every race now not putting any athlete on the pedestal and saying they are unbeatable. Obviously I can only control my race and what I am doing tactically. In some cases it’s just about closing the margin that I am defeated by. I other cases, there are two athletes in Chicago who in their careers have run between 62 and 63 minutes, and in any given day they could be me, and my goal is to beat them and put as much time between me and them as I could, and that was pretty successful. But I think it’s just important, and there are a lot of other intrepid Americans out there who are not afraid to mix it up against international competition. C259: Is there a single race that you are most proud of in your career? Jeffrey: A single race? Each race I’ve done, at least with the marathons I’ve done, each race I’ve become marginally more proud about how I have handled it and carried myself. Obviously Chicago is my personal best, so I can’t be displeased about that race. I mean, there were definitely some areas of that race where I felt there were some lapses of attention, and maybe I didn’t push hard enough or I settled, or vice-versa. Obviously I’m proud anytime I can win a race, and Pittsburgh is one of those once-in-a-lifetime opportunities when you aren’t even planning to complete the race and you win the race. Each race that I’ve done probably in the past year or so I’ve been really happy with how I’ve made progress. Even this year in April, I did the Paris Marathon, maybe not under the best circumstances for me personally. I had an injury problem going into it starting in the winter and an abbreviated build up to the race. I still went out there and laid it on the line. I went through in 1:05:20. I paid for it, I ran maybe an 8:30 final mile to run 2:14. Again, I’m proud that even if it wasn’t my day I just toughed it out. Every race I’m learning so much from. Every race is valuable for that because I carry those experiences with me. So in Moscow, I’ll have at least one or two marathons to call upon where I’ve experienced some form of discomfort that I’ve already had before, so it helps me a lot. C259: You are very consistent, you have seven sub 2:15s in the last 3 years, and we talked about how you race a lot. You also wrote a piece on this for Runners World, we’ll put a link on our site to it, you call yourself a “serial racer.” What does that give you in terms of your performance? Jeffrey: Well I think I received the title rather than proclaimed being a serial racer. C259: Okay, right, that was the headline, that’s right, not your quote. Jeffrey: The concept of serial racing, there’s a different spectrum of it. Yuki Kawauchi is able to run 2:08, 2:10, 2:09 in a month. Maybe I’m putting a couple 2:13s together, or a 2:14 and a 2:13 in a month. I don’t know if I’m the optimal serial racer or if I’m doing something really non-conventional. At this point listening to my body, there are some times when I feel great after a marathon and recovery goes well and I think I can give it another shot. There are other times where I’m like, shoot, I’m out of commisssion and I need to take a break from running marathons or give myself some recovery or do some shorter races. I’ll let my track record speak for itself. I’ve been running marathons since 2010. In 2010 I only ran two marathons, and I ran two 2:14s. At the same time, at my level, it’s pretty lucrative if you do well in a couple marathons. Financially, that can really help your situation if you are not under a shoe contract or not with a salary from a sponsorship. That being said, there are sometimes where it is possible, and other times where it is not. I think at this point in my career, I’m 28 years old, and my goals are now approaching a respectable time in the marathon, where maybe I have to scale back on the quantity of performances to focus on the quality. C259: Does most of your income come from race winnings? You do have a relationship with Marathon Guide, Brooks, PowerBar, and also with NYAC, the club here in New York. Jeffrey: It depends on the year, but I’d say about 2/3 of my means of support come from what I’m able to achieve in two or three marathons a year. I do have a great deal of foundational support from marathonguide.com, from Brooks, from New York Athletic Club, and from PowerBar of course. They provide me with the resources that enable me to carry on in training and really make the commitment to the sport. But at this point in time for a 2:12 marathoner appearance fees are pretty rare. It’s really performance based. All the more necessity for me to go and try to run some good quality performances, because that helps me sustain myself as an athlete. At this point, I consider it a career. To be professional, you have to be able to not lose money at the end of the year. C259: We sometimes talk on the show about the value of a minute to a marathoner, in your case, two minutes and 3 seconds. Would a sub 2:10 change the financial opportunities for you, or some other performance? Jeffrey: In some cases, yes. I’ve thought about this more and more the past year, because in my last few marathons it’s trying to run 2:11 or 2:10 and trying to hang on to 65 minutes for the half marathon. Also there’s a realization now that the marathon has changed, maybe not in the U.S. Definitely in the U.S. now there’s more depth, but it’s usually just a couple of marathoners in the U.S. who will dip under 2:10 in a year. In the grand scheme of things, it’s hard to say whether running 2:10 or running sub 2:10 would be a live-changing performance for me because on the other hand, each year in Dubai you have three or four athletes going under 2:05 or 2:04. There’s a gap between them and us, and given the economy with a lot of the shoe companies, it’s hard to market yourself as a 2:12 or 2:11 or a 2:10 athlete. Obviously, at this point I just focus on continuing to improve. You know, since 2010 when I started each year I’ve taken 70 to 80 seconds off my marathon time, so I can’t complain. I’m heading in the right direction. Whether or not that lands me some financially life-changing experience or not, that’s yet to be seen. And on the other hand, if you win the US title, in 2010 it took 2:14 to win the U.S. title, you can win 25 grand. It’s so arbitrary, you can have a life-changing experience in the marathon and run 2:14, so you’ve got to pick your races correctly too I guess. C259: You do your own marketing I guess of yourself, you don’t have an agent, you don’t have a coach, but do you have any thoughts on how the business model or the marketing of the sport can be improved? Jeffrey: That’s a really good question and I think a lot of athletes and agents are really trying to address that. It’s been a problem for a long time. It stems from the fact that there’s not a lot of interest in distance running. Maybe it’s improving now, but go to Europe. when I went to the Paris Marathon for example, I saw the crowd support for the race and the amount of people out there, just the appreciation of really quality performances. In the U.S. I don’t think there is as much of a fan base for distance running. It has definitely improved over the years and that starts with athletes that are in high school and getting more people involved in the sport to begin with. If you are involved in the sport, then you can follow it and see it anywhere from the amateur to the professional level. I don’t know if I necessarily have any criticism of the business model. I would say there are some things that do hurt our sport. If there are restrictions on the amount of sponsorships that we can have or display on our uniform, or things that will just make it difficult and less likely for sponsors and companies that could potentially help our sport, they are not going to want to invest, because how is their investment realized? I’m a big fan of watching the Tour de France every year in the summer, it gets me fired up when I’m getting ready for a fall marathon, and you see all the sponsors all over the team jerseys. You know the teams by the sponsor’s names. Even if you could implement a little bit of that in the professional side of running, I think it would be great for supporting the athletes and may generate the same sort of buzz that running gets worldwide in other countries. C259: One thing we found very interesting is that you are a vegan. Jeffrey: Well, I was a vegan. I am no longer. C259: So now you have the Paleo diet? Jeffrey: (Laughter). The one thing I’ll always learn, maybe not about running but anything else, is everything in moderation. In 2010 I experimented with being vegan, and I had some great results. It came out of a personal curiosity for me, to try to get my nutrients from plant-based sources. I think there were a lot of positive things that came out of it. It opened me up to trying a variety of different foods that I wouldn’t necessarily try, lots of different vegetables, so I think that was great and it made me more aware of what levels of nutrients I need. As a vegan you have to really be careful about your iron levels, you have to be careful about your B vitamins, so I think it was a really good way for me to learn a little bit about nutrition and what my body really needs, and spending the extra time to make sure I get these nutrients, or else you have some pretty bad effects, if you are deficient. I was a vegan for about a year and a half, and the thing that made me switch the most was actually that when I was in Daegu, I had a really difficult time finding foods that were vegan friendly. A lot of things had fish in them. At that point, when you are traveling internationally, you don’t want to limit your diet to the point where it might not be reasonable to get the correct nutrients. Especially before a race, it’s really important that you’re feeling properly and that your stores are topped off. I didn’t totally abandon being vegan because there are a lot of things I like about it. I love kale. I eat kale at least once a week. Quinoa is a great supergrain to mix with anything. At the same time I’m trying to be realistic about when I’m going to races and when I’m training hard I just want to make sure I’m getting the right nutrients. It was a really great educational process for me. I don’t necessarily recommend that every runner goes through a period of being vegan or detoxing themselves, but it’s really important when you are pushing your body at a certain level through marathon training or for running to take that initiative and really learn what you are fueling your body with. Take the time to learn to make a variety of foods to help fuel yourself. C259: You mentioned the struggle in Daegu. Did nutritional issues play a role in your race there? Jeffrey: I’d say possibly, but I’m not going to hide behind it and say that because I ate kimchi for 10 days in a row it impacted my race. I will say that was my choice and maybe it was a poor choice nutritionally leading up to the race. Definitely in Daegu, I missed a couple of bottles while I was out there and it was really humid, and if you don’t replace your electrolytes, that can be a detriment to your performance. What it makes me realize going forward is that you don’t need to make it harder on yourself than it needs to be, by putting yourself on some type of restrictive diet, especially if there is no allergy or if there is no reaction that requires you to omit something from your diet. It’s going to be a different story going to Moscow. I definitely plan to bring a lot of my own foods too, just so I have things that I’ve eaten before races and eaten before training that I know are comfortable. I bring plenty of PowerBars with me and things to fuel myself and just top off my glycogen storage before the race. C259: We can’t wait to watch you in the race. Sometimes it’s difficult to see beyond the lead pack, but we’ll try as hard as we can to track your performance. C259 (Brenn): I think you’re gonna surprise them like you did in Pittsburgh. Jeffrey: I really look forward to it, and if I can run my best race, I think I can do pretty well in those circumstances. C259: I know your goal is generally to redeem yourself (in your mind, anyway) from Daegu, when you finished 39th. Do you have any time or place targets? Jeffrey: To be in the top 15 or top 20 would be awesome. I won’t rule out anything, and it’s hard to say because we don’t have a full start list so we can’t really analyze what athletes are running, what their personal bests are, when did they set that personal best and what kind of shape they are in now. So there are a lot of variables, but obviously to be top 20 or top 15 in the World Championships is a pretty good result, and obviously that’s better than the 39th place at Deagu, so I’ll look to do that and hopefully be in the mix there, and maybe I’ll find myself late in the race, if I’m running well, maybe moving into one of those spots and I’d be quite pleased. In terms of time goal, it’s really difficult knowing what conditions we’ll be up against with the 3:30 start time. In Boulder, it’s been 90 degrees almost every day or every other day here. I’m getting better at running in the heat here and running pretty well. I won’t rule out the possibility of running a significant personal best. I’d be very happy with that, of course. Even if I’m close to my personal best, I think that will hold up pretty well in the results. C259: That’s fantastic. We believe that Yuki will be on hand. We hope you shake his hand before the race. We hope you pull away from a Kenyan at some point. Jeffrey: I’ll shake Yuki’s hand after he passes the finish behind me. We can talk about what marathon we’ll run next. C259: And we’ll be on hand to cheer you on in New York, which is where we are. Jeffrey: I’m really looking forward to it. New York is going to be a great experience. It’s a great marathon to run. C259: We do have one last question, which is a traditional question we ask. It’s a selfish one, admittedly. Cloud259 is a reference to our goal of breaking 3 hours in the marathon. Brenn and I have gotten close, but not quite there. We’ll be on cloud 9 when we get to 2:59 is what we say. So what is your top training tip for getting under under three hours? C259 (Brenn): And I’ll be doing it at New York, so give me a New York tip. Jeffrey: Hold back until the Queensboro Bridge. Honestly when it comes to chasing a time goal, and I’ve learned this in my own personal experience, there’s a lot of pressure. When you see a barrier, and you have that barrier just in front of you. Definitely it’s within reach for you guys, you guys are so close, and I look at 2:10 the same way, and you’re just kind of running it down. Sometimes you just can’t worry about the pace and you just got to go with the flow of the race, and if that means going out slower and running a negative split, than that’s the way to do it. It’s so easy in our minds when we have something that’s so close to us that it’s almost like this mental barrier – if we just find a way to put ourselves in a place where if we are focusing on the race and another factor, the time will come. It’s destined to come because it’s so close, so you’ve just got to direct your energy into the positive of moving forward and going through each mile and maybe running a negative split or maybe just hanging on for dear life that final mile because you are so close. The continued belief that you are going to get there, and you’ve got to have faith and confidence in the work you’ve done. It might just happen when you least expect it. It will happen. C259: It reminds me of the advice Jeannette Faber gave us that I’ve thought of frequently on runs since then that I really like is that assume that you will do it. What I mentioned at the time then and what I’ve mentioned to others is that it takes the drama out of the race. If you assume you will do it, it’s not an epic struggle to get this thing done. I hope it just puts you in the present moment of the race where you are basically relying on the training that got you there. C259: Right. Jeffrey, thanks so much for your time. Safe travels, and we obviously will be rooting for you, and we hope to talk to you again sometime. See you in New York. Jeffrey: Thank you guys both again. I’m a big fan of the show, and thanks so much to you guys for promoting the sport.